The team began by reviewing the websites of other states that had expanded Medicaid, looking to see if good examples already existed, finding several good examples including Alaska, Kentucky and others. The group noticed that most states that posted expansion information did so using static graphics. Our team, inspired by Dr. Gee’s direction on innovation and transparency, knew that we wanted to do more. Our goal was to create a dashboard that was informative, interactive, and that could easily sync to existing data sources. The team believed this would be of value to those who used the website for information, and also to internal teams. As the design team began to study existing dashboard applications, Medicaid program managers began to define the metrics that would be presented on the site. The goals for these data were; 1) clearly demonstrate enrollment measures, 2) define meaningful outcome measures that were consistent with nationally accepted quality measures, 3) that were readily accessible by internal data analysts, and 4) that could be displayed easily and quickly without expensive programming costs or staff time. The values displayed in each graph and the map are not hard-coded, but instead are contained in separate csv or json files. Our Medicaid Health Economics and Quality teams provide the data in spreadsheets. Custom scripts are then used to parse the spreadsheets, make individual data files for each component, and transfer the data files to our development server for review before transferring to the public site. Because the values are not hard-coded in the graphs, the site can be updated quickly when new data is available. In the future, our goal is to completely automate the process. The results of the team’s effort can be found here (for both traditional displays and mobile devices). The enrollment data is updated weekly and can be viewed at both the state and parish level. The outcomes measures are updated every two weeks. Each measure is expandable, allowing users to get even more info and charts/graphs. Additionally, clicking on or touching the map shows outcome measures at the parish level. The data displayed in the graphs and map are available for download from a menu on the graph or map. Critically, LDH built this tool in-house and at no additional taxpayer expense. Where some states hired consulting firms to develop their dashboards (for example, Kentucky used Deloitte Consulting), Louisiana’s team had no funding for expensive vendors or consultants, relying solely on collaboration across the Department and our in-house, talented team members. Today, our dashboard not only allows citizens, state officials, news reporters and others to get Louisiana Medicaid expansion data quickly, it is also being recognized by others. Officials from Ohio, California and Colorado have contacted us about our site, seeking input and information to help them develop similar sites for their states. Andy Slavitt, former administrator of the Centers for Medicare and Medicaid Services (CMS), has promoted our dashboard in his communications. Gallop has included it in news stories about their poll results, and the dashboard’s online link or URL appears in almost all news stories about Louisiana Medicaid expansion. 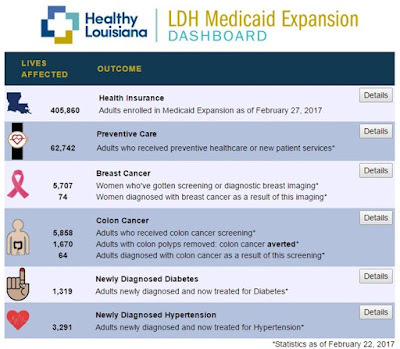 From research to design to execution to results, the dashboard that is known as the HealthyLaDashboard has fulfilled the vision of Secretary Gee, Louisiana’s Governor, John Bel Edwards, and the agency’s leadership. Providing transparent, easy-to-understand data helps inform citizens, drive policy change, and help prove we are finally on the road to a healthier Louisiana. 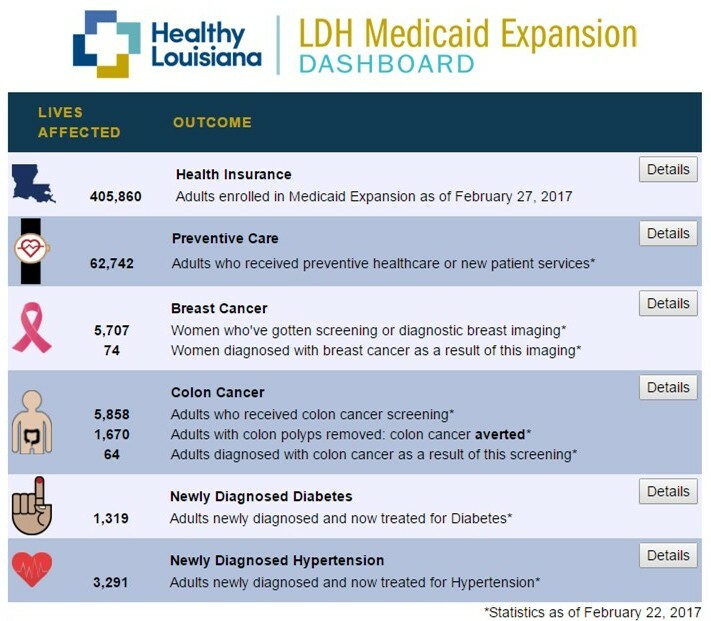 It would be a good idea to create a similar data website that demonstrates the successes of the rest of the Healthy Louisiana program, the Medicaid MCO's. The Medicaid Dashboard has been an important tool in my tool-box. I use data from the dashboard daily in my communications about the impact of the ACA in LA. Not only do I have access to real-time enrollment numbers but I can also identify relevant outcomes at a more granular level.